This is part of The Digital Athletic Log. Use the Digital Athletic Log to keep track of your training and goals in multiple sports. Read the 1 page summary or browse the online documentation for the Digital Athletic Log to learn more!!! Also, see the Athletic Fluid Loss Calculator. This page calculates and displays elapse times at various mile or km marks for a given distance and goal time. The list is formatted to be worn as a wristband during the run or ride. I use it for my marathons and triathlons. The wristband and a stop-watch allow you to determine at a glance if your are ahead or behind your goal pace. A table listing your elapse times at various mile/km markers is generated. Print and cut out the table. You can wear it as a wristband (or tape it to the top tube / aero bars of your bike). I put a layer of clear tape over the numbers to prevent them from bleeding when wet. Don't forget to start the stop-watch at the beginning of the race ;-) !!! 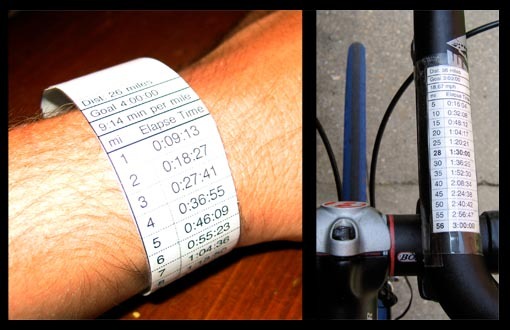 Track your pace and split times easily on your wrist or bike. This Digitial Athletic Log is created and maintained by Roger Cortesi. Send questions, comments, and bug reports to rcortesi@mit.edu.